Cognition is "the mental action or process of acquiring knowledge and understanding through thought, experience, and the senses." It encompasses processes such as knowledge, attention, memory and working memory, judgment and evaluation, reasoning and "computation", problem solving and decision making, comprehension and production of language, etc. Human cognition is conscious and unconscious, concrete or abstract, as well as intuitive (like knowledge of a language) and conceptual (like a model of a language). Cognitive processes use existing knowledge and generate new knowledge. The processes are analyzed from different perspectives within different contexts, notably in the fields of linguistics, anesthesia, neuroscience, psychiatry, psychology, education, philosophy, anthropology, biology, systemics, logic, and computer science. These and other different approaches to the analysis of cognition are synthesised in the developing field of cognitive science, a progressively autonomous academic discipline. Within psychology and philosophy, the concept of cognition is closely related to abstract concepts such as mind and intelligence. It encompasses the mental functions, mental processes (thoughts), and states of intelligent entities (humans, collaborative groups, human organizations, highly autonomous machines, and artificial intelligences). Thus, the term's usage varies across disciplines; for example, in psychology and cognitive science, "cognition" usually refers to an information processing view of an individual's psychological functions. It is also used in a branch of social psychology called social cognition to explain attitudes, attribution, and group dynamics. In cognitive psychology and cognitive engineering, cognition is typically assumed to be information processing in a participant’s or operator’s mind or brain. Cognition can in some specific and abstract sense also be artificial. The term "cognition" is often incorrectly used to mean "cognitive abilities" or "cognitive skills." The word cognition comes from the Latin verb cognosco (con 'with' and gnōscō 'know') (itself a cognate of the Greek verb γι(γ)νώσκω gi(g)nόsko, meaning 'I know, perceive' (noun: γνώσις gnόsis 'knowledge')) meaning 'to conceptualize' or 'to recognize'. Cognition is a word that dates back to the 15th century, when it meant "thinking and awareness". Attention to the cognitive process came about more than eighteen centuries ago, beginning with Aristotle and his interest in the inner workings of the mind and how they affect the human experience. Aristotle focused on cognitive areas pertaining to memory, perception, and mental imagery. The Greek philosopher found great importance in ensuring that his studies were based on empirical evidence; scientific information that is gathered through observation and conscientious experimentation. Centuries later, as psychology became a burgeoning field of study in Europe and then gained a following in America, other scientists like Wilhelm Wundt, Herman Ebbinghaus, Mary Whiton Calkins, and William James, to name a few, would offer their contributions to the study of cognition. Wilhelm Wundt (1832–1920) heavily emphasized the notion of what he called introspection: examining the inner feelings of an individual. With introspection, the subject had to be careful to describe his or her feelings in the most objective manner possible in order for Wundt to find the information scientific. Though Wundt's contributions are by no means minimal, modern psychologists find his methods to be quite subjective and choose to rely on more objective procedures of experimentation to make conclusions about the human cognitive process. Hermann Ebbinghaus (1850–1909) conducted cognitive studies that mainly examined the function and capacity of human memory. Ebbinghaus developed his own experiment in which he constructed over 2,000 syllables made out of nonexistent words, for instance EAS. He then examined his own personal ability to learn these non-words. He purposely chose non-words as opposed to real words to control for the influence of pre-existing experience on what the words might symbolize, thus enabling easier recollection of them. Ebbinghaus observed and hypothesized a number of variables that may have affected his ability to learn and recall the non-words he created. One of the reasons, he concluded, was the amount of time between the presentation of the list of stimuli and the recitation or recall of same. Ebbinghaus was the first to record and plot a "learning curve," and a "forgetting curve." His work heavily influenced the study of serial position and its effect on memory, discussed in subsequent sections. Mary Whiton Calkins (1863–1930) was an influential American pioneer in the realm of psychology. Her work also focused on the human memory capacity. A common theory, called the recency effect, can be attributed to the studies that she conducted. The recency effect, also discussed in the subsequent experiment section, is the tendency for individuals to be able to accurately recollect the final items presented in a sequence of stimuli. Her theory is closely related to the aforementioned study and conclusion of the memory experiments conducted by Hermann Ebbinghaus. William James (1842–1910) is another pivotal figure in the history of cognitive science. James was quite discontent with Wundt's emphasis on introspection and Ebbinghaus' use of nonsense stimuli. He instead chose to focus on the human learning experience in everyday life and its importance to the study of cognition. James' major contribution was his textbook Principles of Psychology that preliminarily examines many aspects of cognition like perception, memory, reasoning, and attention, to name a few. The sort of mental processes described as cognitive are largely influenced by research which has successfully used this paradigm in the past, likely starting with Thomas Aquinas, who divided the study of behavior into two broad categories: cognitive (how we know the world), and affective (how we understand the world via feelings and emotions). Consequently, this description tends to apply to processes such as memory, association, concept formation, pattern recognition, language, attention, perception, action, problem solving and mental imagery. Traditionally, emotion was not thought of as a cognitive process. This division is now regarded as largely artificial, and much research is currently being undertaken to examine the cognitive psychology of emotion; research also includes one's awareness of one's own strategies and methods of cognition called metacognition and includes metamemory. While few people would deny that cognitive processes are a function of the brain, a cognitive theory will not necessarily make reference to the brain or other biological process (compare neurocognitive). It may purely describe behavior in terms of information flow or function. Relatively recent fields of study such as cognitive science and neuropsychology aim to bridge this gap, using cognitive paradigms to understand how the brain implements these information-processing functions (see also cognitive neuroscience), or how pure information-processing systems (e.g., computers) can simulate cognition (see also artificial intelligence). The branch of psychology that studies brain injury to infer normal cognitive function is called cognitive neuropsychology. The links of cognition to evolutionary demands are studied through the investigation of animal cognition. And conversely, evolutionary-based perspectives can inform hypotheses about cognitive functional systems' evolutionary psychology. Cognition is severely damaged in dementia. For every individual, the social context in which he or she is embedded provides the symbols of his or her representation and linguistic expression. The human society sets the environment where the newborn will be socialized and develop his or her cognition. For example, face perception in human babies emerges by the age of two months: young children at a playground or swimming pool develop their social recognition by being exposed to multiple faces and associating the experiences to those faces. Education has the explicit task in society of developing cognition. Choices are made regarding the environment and permitted action that lead to a formed experience. Language acquisition is an example of an emergent behavior. From a large systemic perspective, cognition is considered closely related to the social and human organization functioning and constrains. For example, the macro-choices made by the teachers influence the micro-choices made by students..
For years, sociologists and psychologists have conducted studies on cognitive development or the construction of human thought or mental processes. Jean Piaget was one of the most important and influential people in the field of Developmental Psychology. He believed that humans are unique in comparison to animals because we have the capacity to do "abstract symbolic reasoning." His work can be compared to Lev Vygotsky, Sigmund Freud, and Erik Erikson who were also great contributors in the field of Developmental Psychology. Today, Piaget is known for studying the cognitive development in children. He studied his own three children and their intellectual development and came up with a theory that describes the stages children pass through during development. Sensorimotor stage Infancy (0–2 years) Intelligence is present; motor activity but no symbols; knowledge is developing yet limited; knowledge is based on experiences/ interactions; mobility allows child to learn new things; some language skills are developed at the end of this stage. The goal is to develop object permanence; achieves basic understanding of causality, time, and space. Pre-operational stage Toddler and Early Childhood (2–7 years) Symbols or language skills are present; memory and imagination are developed; nonreversible and nonlogical thinking; shows intuitive problem solving; begins to see relationships; grasps concept of conservation of numbers; egocentric thinking predominates. Formal operational stage Adolescence and Adulthood (12 years and on) Logical use of symbols related to abstract concepts; Acquires flexibility in thinking as well as the capacities for abstract thinking and mental hypothesis testing; can consider possible alternatives in complex reasoning and problem solving. The serial position experiment is meant to test a theory of memory that states that when information is given in a serial manner, we tend to remember information in the beginning of the sequence, called the primacy effect, and information in the end of the sequence, called the recency effect. Consequently, information given in the middle of the sequence is typically forgotten, or not recalled as easily. This study predicts that the recency effect is stronger than the primacy effect because the information that is most recently learned is still in working memory when asked to be recalled. Information that is learned first still has to go through a retrieval process. This experiment focuses on human memory processes. The word superiority experiment presents a subject with a word, or a letter by itself, for a brief period of time, i.e. 40ms, and they are then asked to recall the letter that was in a particular location in the word. By theory, the subject should be better able to correctly recall the letter when it was presented in a word than when it was presented in isolation. This experiment focuses on human speech and language. In the Brown-Peterson experiment, participants are briefly presented with a trigram and in one particular version of the experiment, they are then given a distractor task, asking them to identify whether a sequence of words are in fact words, or non-words (due to being misspelled, etc.). After the distractor task, they are asked to recall the trigram from before the distractor task. In theory, the longer the distractor task, the harder it will be for participants to correctly recall the trigram. This experiment focuses on human short-term memory. During the memory span experiment, each subject is presented with a sequence of stimuli of the same kind; words depicting objects, numbers, letters that sound similar, and letters that sound dissimilar. After being presented with the stimuli, the subject is asked to recall the sequence of stimuli that they were given in the exact order in which it was given. In one particular version of the experiment, if the subject recalled a list correctly, the list length increased by one for that type of material, and vice versa if it was recalled incorrectly. The theory is that people have a memory span of about seven items for numbers, the same for letters that sound dissimilar and short words. The memory span is projected to be shorter with letters that sound similar and longer words. In one version of the visual search experiment, a participant is presented with a window that displays circles and squares scattered across it. The participant is to identify whether there is a green circle on the window. In the "featured" search, the subject is presented with several trial windows that have blue squares or circles and one green circle or no green circle in it at all. In the "conjunctive" search, the subject is presented with trial windows that have blue circles or green squares and a present or absent green circle whose presence the participant is asked to identify. What is expected is that in the feature searches, reaction time, that is the time it takes for a participant to identify whether a green circle is present or not, should not change as the number of distractors increases. Conjunctive searches where the target is absent should have a longer reaction time than the conjunctive searches where the target is present. The theory is that in feature searches, it is easy to spot the target or if it is absent because of the difference in color between the target and the distractors. 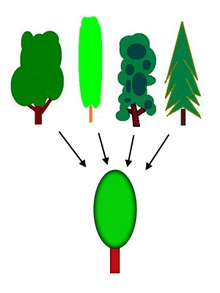 In conjunctive searches where the target is absent, reaction time increases because the subject has to look at each shape to determine whether it is the target or not because some of the distractors if not all of them, are the same color as the target stimuli. Conjunctive searches where the target is present take less time because if the target is found, the search between each shape, stops. The semantic network of knowledge representation systems has been studied in various paradigms. One of the oldest is the leveling and sharpening of stories as they are repeated from memory studied by Bartlett. The semantic differential used factor analysis to determine the main meanings of words, finding that value or "goodness" of words is the first factor. More controlled experiments examine the categorical relationships of words in free recall. The hierarchical structure of words has been explicitly mapped in George Miller's Wordnet. More dynamic models of semantic networks have been created and tested with neural network experiments based on computational systems such as latent semantic analysis (LSA), Bayesian analysis, and multidimensional factor analysis. The semantics (meaning) of words is studied by all the disciplines of cognitive science. ↑ "cognition - definition of cognition in English from the Oxford dictionary". www.oxforddictionaries.com. Retrieved 2016-02-04. 1 2 Blomberg, O. (2011). "Concepts of cognition for cognitive engineering". International Journal of Aviation Psychology. 21 (1): 85–104. doi:10.1080/10508414.2011.537561. ↑ Sternberg, R. J., & Sternberg, K. (2009). Cognitive psychology (6th Ed.). Belmont, CA: Wadsworth, Cengage Learning. ↑ Stefano Franchi, Francesco Bianchini. "On The Historical Dynamics Of Cognitive Science: A View From The Periphery". The Search for a Theory of Cognition: Early Mechanisms and New Ideas. Rodopi, 2011. p. XIV. 1 2 Fuchs, A. H.; Milar, K.J. (2003). "Psychology as a science". Handbook of psychology. 1 (The history of psychology): 1–26. doi:10.1002/0471264385.wei0101. 1 2 Matlin, Margaret (2009). Cognition. Hoboken, NJ: John Wiley & Sons, Inc. p. 5. ↑ Cherry, Kendra. "Jean Piaget Biography". The New York Times Company. Retrieved 18 September 2012. ↑ Parke, R. D., & Gauvain, M. (2009). Child psychology: A contemporary viewpoint (7th Ed.). Boston, MA: McGraw-Hill. ↑ May, C.; Hasher, L.; Kane, M. (1999). "The role of interference in memory span". Memory & Cognition. 27 (5): 759–767. doi:10.3758/BF03198529. Stanovich, Keith (2009). What Intelligence Tests Miss: The Psychology of Rational Thought. New Haven (CT): Yale University Press. ISBN 978-0-300-12385-2. Lay summary (PDF) (21 November 2010). Look up cognition in Wiktionary, the free dictionary.